Heath Ledger. Jake Gyllenhaal. Michelle Williams. Anne Hathaway. Dennis Quaid. Anna Faris. Linda Cardellini. Drama. Romance. 1960s. 1970s. 1980s. Weepie / Tear Jerker. 01 Mel's Must Sees. Gay Interest. Recommended. 01 Adam's Faves. Venice Film Festival Best Film. BAFTA (Best Film). BAFTA (Best Direction). Oscar (Best Director). Guardian 1000 Must See (2007). Ennis and Jack are two young men working as herders on a vast sheep ranch in the heart of Wyoming. It is the 1960s but the sexual revolution is in no rush to reach this wilderness and when their relationship spills over into consummated love the two boys are ill equipped to handle what they feel. Over the next twenty years Ennis and Jack settle into conventional lives, dictated by their strict social environment, both get married and both have children but neither can escape the true love they so fleetingly experienced, a relentless torment from which there is no easy escape. 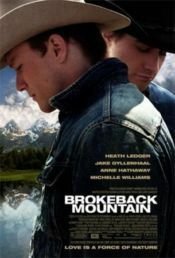 Brokeback Mountain is an exquisitely realised film, from the visual beauty of the setting to the sensitive adaptation of Annie Proulx's short story and the career defining performance of the two leads. This tender, thoughtful and intelligent tale transcends any of the obvious genre pegs�a prerequisite of most exceptional movies.